The first part of K's four part series. Enjoy! You’ve probably never had real balsamic vinegar. I didn’t realize that was true for me until a few days ago when I had the opportunity to have the real stuff! Let me tell you about what I’ve learned. Read on with this four part series on our food experience. To start things off, I should give you some history. As I’m writing this I’m sitting in my hotel room in Bologna, Italy. Bologna is a really fun city to explore and it doesn’t take that long. Most of the main streets are arcaded which makes even the hottest day enjoyable. It holds Europe’s oldest university (est. 1088) and is a must for any culinary adventure. I bet when you think of “ragu,” you probably think of a brand of spaghetti sauce. Ragù is actually the name of the local bolognese sauce which is exactly what you think it is (expect there isn’t added sugar). Additionally tortellini and lasagna have their origins in the region. I’ve been in love with this region and I didn’t even know it! If pasta isn’t your thing, they also created mortadella, which we know as baloney. In my opinion, this makes Bologna the culinary equivalent to a Roman forum. The city is not very touristy, which is really nice, and most of the things worth seeing in the city center are actually free. We did find a tour that did look very interesting though. It’s called Italian Days Food Experience and it offers “culinary adventure and food education.” I had no idea how true that was going to be. You always have to wonder about a tour you can only research online, but when we looked at the reviews on TripAdvisor we found over 300 reviews which were all five stars. This just doesn’t happen online. The last time that happened was when I found a five star cat heating pad on Amazon. The cats loved it! But back to the story...we knew we were in a for a treat. The tour is run by a wonderful couple, Alessandro and Barbara. Barbara handled all of the emailing and scheduling and Alessandro actually conducted the tour. On our chosen day we had to get up crazy early and be outside our hotel at 7:25am. The driver was 10 minutes late, but Alessandro gave us a call to let us know they were running late. Once we got picked up we were driven about 25 miles outside the city in a quiet, unmarked van. Luckily, the driver was wearing an Italian suit and aviators, so we knew it was legit. We quickly learned about what real parmigiano-reggiano cheese is and how it is actually controlled by an consortium that holds regulating authority. I’ll spare you the details but the important part is that Denominazione di origine controllata, controlled designation of origin, or simply DOP is the all powerful authority. 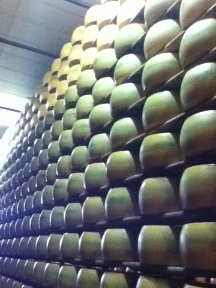 I learned why we were at the cheese factory so early, they actually start to make the cheese around 5am. We missed the cooking part, but were able to watch them pull the cheese out of the massive 110 gallon copper cooking vats. They began pulling the massive blocks of cheese out and the head chef (I guess you could call him the big cheese) cut them into what would become the cheese wheel. We were slightly shocked by the lack of hairnet and tank top, but with cheese this tasty, what are you to do? Following this, we toured the rest of the cheese factory to learn about the rest of the process and how much waiting is involved. 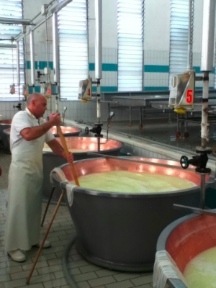 Before I give you the quick version, I wanted to point out that we also go to see ricotta being made. It’s actually just recooked milk/water/salt and a little steam. 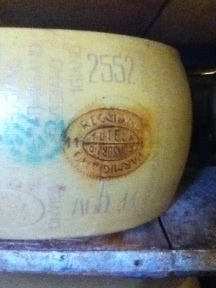 It’s a byproduct of the process of making parmigiano-reggiano. The factory sells the fresh stuff to make some extra money. Back to the real cheese. After the tour we were given some Lambrusco, which is a local fizzy red wine. There was also some 14 and 24 month samples of cheese. The older the cheese the more “crystals” that are in it. I had always assumed this was the salt in the cheese, but I learned that it is actually the free amino acids that have been created in the process. Already one fourth finished with my culinary adventure and I received a food education.